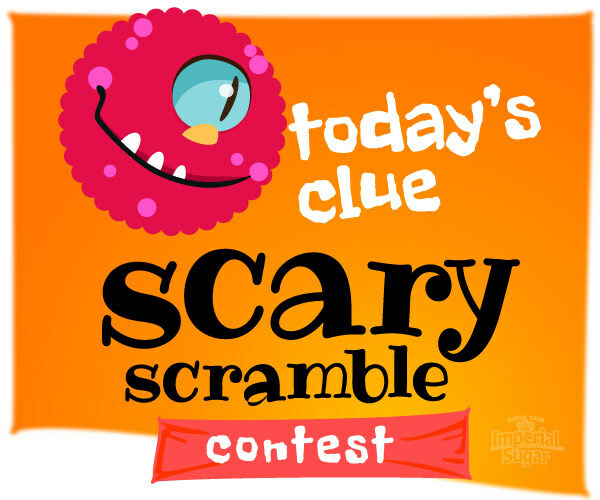 Let's get ready to play the Scary Scramble Contest! Each day from October 7 – 14, 2018, we’ll post a scrambled-up title of one of our frightfully good Halloween recipes, plus a clue to help decipher it. You'll take that title and clue and search the Halloween recipe section of ImperialSugar.com. Once you unscramble the title, copy the website address, return back here and complete the entry form below. 25 winners will each receive a holiday baking kit that includes 10 free sugar vouchers, one silicone baking mat, one set of collapsible measuring cups, one apron, and holiday recipe cards! Contest runs from Sunday, October 7 - Sunday, October 14, 2018. At the end of the contest period, we’ll hold a random drawing from all valid entries. 25 lucky winners will receive a holiday baking kit to include 10 free sugar vouchers, one silicone baking mat, one set of collapsible measuring cups, one apron, and holiday recipe cards! This itsy bitsy confection went up the water spout and when people tried it they were hooked without a doubt! Take this classic striped Halloween candy, and turn it into a cake for a twist that’s so dandy! Don’t go bobbing for these on a cold fall night, dip them in caramel and chocolate for a crunchy, sweet bite. Creepy crawlies coming up from the dirt, share this pie and no one gets hurt! On Dia de los Muertos, have these colorful treats on hand. You’ll be “ahead” with oohs and ahhs for the best dessert in the land. If you’re working in the lab late at night, this crunchy green monster might give you a fright! This crazy good appetizer has people dying to dip in; serve with fruit and it’s a Halloween win. This airborne lady is hard to catch – she’s all mixed up in a yummy sweet batch!